Rick was born in Pueblo Colorado and when he was just 9, he got a cassette tape recorder for Christmas, and knew he wanted to be on the radio! Rick worked at several stations in Pueblo Colorado and Laramie Wyoming, before moving to Las Vegas in 1986 He had been on the radio there for ov Phoenix! Some of his favorite Country Music moments were sitting down with King George Strait in a round table discussion. Introducing Reba/Brooks and Dunn to National Media for their run at Caesar Palace. And being the worst security guard ever for Thomas Rhett at The Foundation Room at Mandalay Bay, surpassed only by being the worst 1 day Roadie for Eric Church! Rick is a member of the Nevada Broadcasters Association Hall of Fame. He enjoys music, movies, and sports, and is a true Denver Bronco fan from way back. He has been a Suns fan since the 80’s, and is David Johnson from the Cards biggest cheerleader. 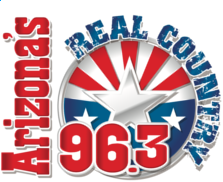 He has really fallen in love with The Valley of The Sun, and is happy to be working alongside some of the nicest and most talented people in the industry at 963 Real Country! Growing up on his Grandparents farm in Pueblo, Country Music is in his blood, and of all the formats he has worked, Country music has the best and most loyal fans. “Our listeners at 96.3 Real Country have welcomed me with open arms, and I can’t wait to meet every one of them” says Rick, “They already feel like family to me”. Rick and Tiff have 5 great kids and 7 Grandkids. They definitely keep him in his toes.